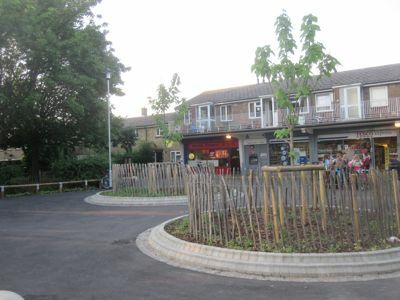 Cambridge City Council is Considering Felling Two Trees in front of Tesco on Campkin Road in Cambridge. At Cambridge City Council’s North Area Committee on the 27th of August 2009 I observed councillors receive an update on plans for the area infront of Tesco on Campkin Road. The roots of the trees are making the pavement uneven and councillors are in my view over-reacting by considering felling the trees. Tree felling was not mentioned in the July North Area Committee meeting when councillors agreed to run a public consultation, but it is now included as one of the options in that consultation. The decision to consider felling the trees appears to have been made by the project’s lead councillor, Mike Pitt, between public meetings of the North Area Committee. While I have repeatedly suggested it would be a good idea, in the interests of openness and transparency, for councillors to report actions they have taken between meetings to the next meeting, this does not happen. The more sensible option of resurfacing is however still on the table. Councillors considered the item in a matter of seconds, and did not clarify key points such as who would be consulted or make clear what would happen after the consultation ie. if the matter would return to councillors or if as sometimes happens the action will be taken on the basis of the outcome of the consultation. A consultation letter, dated the 17th of August (which may have been a draft, or it may have been sent on that date) was appended to the committee papers. The papers themselves though referred to the consultation as something which was to happen in the future: “two options will be put forward in a public consultation”. I have not received a consultation letter through my letterbox, and the consultation is not listed on the council website’s consultations page. Outside the meeting I asked the council officer who had presented the report who would be consulted. I was told the aim was to consult the users of the store, and I was offered details of a proposed consultation area to be sent to me by email. I have also written to the council’s tree officers asking for clarification of the process for making a decision on these proposed fellings. Councillors at the North Area Committee have been told before that felling trees is the best or only way to deal with tree roots making a pavement uneven. Recently, after months of protestations from officers, they eventually decided to resurface a disrupted stretch of path between Crowland Way and Campkin Road and that worked fine. There are paths throughout the city which have been successfully repaired following damage caused by tree roots. This entry was tagged North Area Committee, Trees on August 30, 2009 by Richard Taylor. If this were a large company, I’d say that they were trying to shift costs between departments. Do council tree works and pavement repairs come out of different budgets? Brian, I believe that whatever the decision is made to do, the funding will come from the North Area Committee’s “Environmental Improvements” budget. Trees are generally planted for aesthetic and physcological reasons. Both options should be seen to have had full appraisal. I would hate to think that if tree felling were the cheaper or more expedient option, that they will be removed without due regard for the general feeling of wellbeing and worthiness of the local residents in an area that already seems to have enough problems. I’m wouldn’t happen in so easily or at all in Newnham for instance. Don’t suppose you’d see a Tesco Express in Newnham either, trees or no trees in front of it, but I might be wrong, given Tesco’s apparent need to have another of its mediocre shops in every part of the City. 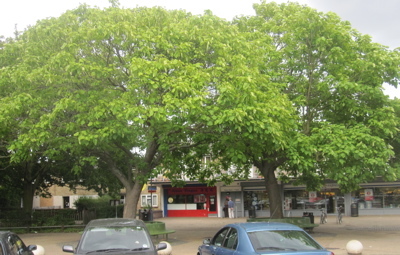 The public consultation on two options for the forecourts, option 1 to retain the existing two trees and option 2 to replace them was distributed on 18th August 2009. There were 1480 explanatory letters, proposals plans and reply slips distributed and the closing date is 11 September. The information has also been on display in the Meadows and Arbury Community Centres, City Homes North office, 31 Lawrence Way and in Tesco itself. I have also spoken to the manager of Tesco who I believe was contacting his head office about the proposals and access to the shop. The distribution covered an area around the Tesco shop itself as follows – to the north – up to and including Northfield Av, Cameron Road and Campkin Rd, to the east – up to and including Markham Close, Lavender Road, St Kilda Avenue and Woodhouse Way, to the south up to and including Campkin Road, Atkins Close Wilson Cls, Larkin Cls and south-west up to and including Arbury Road. Appendix 4 of the EIP report showed the proposals clearly, including the 2 options. The results of the consultation will be reported to North Area Ctte on 12 November. The council’s planning committee considered the tree felling element of the plans on the 21st of October. They supported the felling of the trees. The final decision will on if the tree felling is to be permitted will be taken by Liberal Democrat Cllr Smart, the Executive Councillor for housing. The report to the planning meeting stated that 91 consultation response slips were returned in favour of retaining the trees and 146 in favour of felling. It appears that the numbers in the consultation report were made up of only responses on official response slips. Option 1 to retain existing trees and resurface area over the top of existing surfacing. Option 2 to replace existing trees in purpose built tree pits and resurface area. I can understand why, based on those descriptions, Option 2 is more attractive as resurfacing over the top of what’s there already is a crazy and impractical idea. I also believe if these were the two options on the reply slip the consultation misrepresented the detail of the proposal in option one, which does not involve any change in the ground level. The North Area committee, meeting on the 12th of November, will decide if to go-ahead with the the work (with the tree felling subject to Cllr Smart’s decision). The report on the subject to that meeting reveals that this will not be the last time councillors consider the matter with it due to return to a North Area Committee in January by when detailed design and costings will be available. It is astounding how many times the same items are brought back to council committees. I think they ought institute a policy of making decisions once then moving on; as well as saving councillors’ time and sanity it would also help those supporting or opposing a decision as they would only have to make their representations once. This story has now appeared in the Cambridge News with a positive spin about “sprucing up” Campkin Road. Publicity is given to a meeting tomorrow evening (although it’s not very clear if this is a meeting which is open to the public). The meeting on Thursday Evening is public. It’s the North Area committee (not the East Area) as the Cambridge-News article says. The article also refers to the trees to be felled as “old”. I think this is a misleading term for healthy mature trees, which is what the council’s expert report states they are. I think the reference to “old” in the Cambridge-News article is likely to be Lib Dem spin justifying tree felling. I’ve spoken to a great many people about tree felling in Cambridge and almost everyone first says something along the lines of “if the council are felling it then surely it must be dying / diseased / dangerous”; there’s a lot of implicit trust in councillors to do the right thing from people who’ve not looked into the detail of their decisions. I think it’s really important to highlight that so many of the trees in the City which the Liberal Democrats have felled have been perfectly healthy. It’s not beyond the wit of man to get a quality surface and retain the trees yet no proposal for (and costing) of such an option has been provided. As I’ve said in my article I’ve witnessed councillors be told that it is impossible to fix paths disrupted by tree roots on many occasions. In the Crowland Way case councillors persisted and instructed their officers to pursue a resurfacing option they had claimed was impossible. Based on the way I’ve seen Lib Dems make decisions before they’ll put an inordinate amount of weight on number of consultee comments for each option and make a decision in light of what they see as locally expressed opinion. That’s what Lib Dem localism too often amounts to in cases like this – mob rule and not democracy. I attended the North Area committee on the 12th of November. I spoke in favour of saving the trees; saying I didn’t believe it was beyond the wit of man to come up with a way of making the surface smooth and keeping the trees and made some of the other points I’ve made above. Cllr Smart, the Liberal Democrat Executive Councillor who had to decide on the felling was present. After listening to an officer presentation in which the trees were described as having a thinning crown, and after it had been reported that the planning committee’s view was that the trees ought be felled, Cllr Smart announced that her decision was to have the the trees cut down. After Cllr Smart’s decision the North Area Committee unanimously approved a £75,000 improvements scheme involving replacing the trees with “semi-mature” replacements of the same species. Cllrs Pitt and Smart both explained their decision saying they felt was the best option for the long term. Cllr McGovern said that previous repairs to the surface in 2001 had cost £44,000 but hadn’t lasted (If that figure’s true I think that was an astonishing waste of money), and while I can see why in light of that appearing to learn a lesson from a mistake is an attractive option I wonder if a different approach was taken because council officers involved in the failed scheme didn’t want to admit mistakes had made in 2001 and preferred to blame the concept rather than their implementation. This might explain the unusual situation, which I drew attention to when I spoke, of the council officer being quoted in the Cambridge News as being in support of one of the two options (the tree felling one) before councillors had made their decision. I think the council ought investigate the competence of any officers involved in the 2001 project who are still working for the council so that the public can be assured that the money the council is spending now is being spent on projects that will last. Cllr Pitt implied the outcome of the consultation was a major factor in his decision to vote for felling the trees. The trees have been felled and the area tarmaced. At the North Area Committee on the 10th of June Cllr Pitt queried if the replacement trees which had been planted were in fact “semi-mature” as had been specified. He said they didn’t look “semi-mature” to him noting “they do appear rather small”, he asked: “Did we get what we ordered?”. Cllr Pitt urged officers to keep an eye on the trees. Andrew Preston, the council officer from the Environmental Improvements team who was attending the North Area committee said the trees didn’t look as large as he’d been expecting either. He reported to councillors that he had consulted with the City Council’s tree officers and they had confirmed that the trees did meet the specification given. Mr Preston told councillors that as part of the improvement works there was a contract in place for the trees to be watered, maintained and warranty’d for two years. I am not impressed by the quality of the job which has been done; it certainly doesn’t look to me like £75,000 worth of work; it just looks like a cheap bit of tarmac. I think councillors have again failed to get value for the public money they’re spending, and have missed an opportunity to really improve the area. It is also presumably a lesson to Councillors to ask more specific questions when confronted with a term like “semi-mature”. Like them, I would probably assume that a “semi-mature” tree might be something like half its full-grown size, rather than considerably smaller. Presumably the “tree officers” were probably well aware that members were being allowed to mislead themselves on this question. A local resident attended the North Area Committee on the 15th of July 2010 to complain about the location and appearance of the recycling bins. (A new design of bins – arranged in a circle out in the open of the area in-front of the shops had been introduced as part of the works). Cllr Pitt asked if they had been installed as-per the plans and the resident confirmed they had been and explained that she simply didn’t agree that the design and location was appropriate for the area. The resident then explained her main problem was the fly-tipping alongside the recycling bins, which due to the location of the bins resulted in the tipped rubbish getting in the way of people walking to the shop. Cllr Pitt said the area should be litter picked daily; and welcomed complaints if that wasn’t happening. A City Council ranger present confirmed that people were regularly dumping rubbish next to the recyling bins. The Ranger reported that three pieces of evidence had been recovered from such fly-tipped rubbish and an reported to the committee that the Rangers were “on the trail of who is doing it”. The North Area committee chair, Cllr Ian Nimmo-Smith gave the Ranger “best wishes for the investigation”.